Today in Masonic History Charles William "The Big Bomber" Conacher, Sr. is born in 1909. Charles William "The Big Bomber" Conacher, Sr. was a Canadian hockey player and coach. Conacher was born on December 20th, 1909 in Toronto, Ontario, Canada. He started playing hockey in the junior leagues. He played for the Toronto Marlboros where he racked up massive scoring numbers. He also helped lead the team to two Memorial Cup championships. Combined in the two playoffs he made 50 goals, 28 of them in the second playoffs in 1929, where the Marlboros won the Memorial Cup. 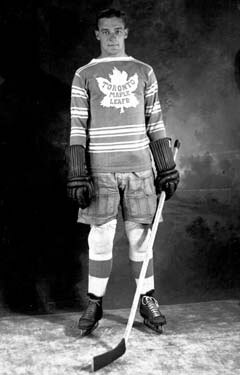 In 1929, Conacher was signed to the Toronto Maple Leafs. At the same time two other team mates were signed Harvey "Busher" Jackson and Joe Primeau. The three were referred to as the "Kid Line" due to their lack of experience. Jackson was 18, Conacher 20 and Primeau 23. In some reports it states that both Conacher and Jackson were 18, this would be impossible since Jackson was not born until 1911. In Conacher's first season he scored 20 goals despite missing 6 games due to injury. In Conacher's second season again he was plagued by injury. Still he managed to score 31 goals and let the league in goals. In 1932, the Maple Leafs moved to Maple Leaf Gardens. A trade was proposed to the Maple Leafs from the Chicago Black Hawks. In exchange for Conacher and defenceman King Clancy, the Black Hawks offered Johnny Gottselig. In response to the trade offer Toronto manager Conn Smythe cabled that that Santa Claus lived at the North Pole, not in Maple Leaf Gardens. It was around this time that Conacher was missing more time due to an injured hand. At the time league rules required that any player receiving 3 major penalties would be suspended for one game. The coach of the Maple Leafs had Conacher, who already had two major penalties, get dressed like he was going to play. At the time any player jumping on the ice while their team was at full strength automatically received a major penalty. Conacher jumped on the ice, received the penalty and was suspended for one game, a game which he was not going to be able to play in because of his injury. In 1933, Conacher broke his collarbone and was out for several weeks. This was the only year in a six year stretch that he did not lead the league in goals. Over the rest of the 1930's Conacher began to slow down as the injuries began to catch up to him. He eventually retired after the 1941 season. After retiring Conacher coached minor league hockey teams and coached the Chicago Black Hawks for 3 years. During this time, a local sports reporter who attempted to interview Conacher was punched in the face because Conacher did not like his questions. Conacher was fined by the league and Conacher apologized to the reporter. Conacher was inducted into the Hockey Hall of Fame and the Ontario Sports Hall of Fame. Conacher passed away on December 30th, 1967. Conacher was a member of North Gate Lodge No. 591 in Pickering, Ontario, Canada.